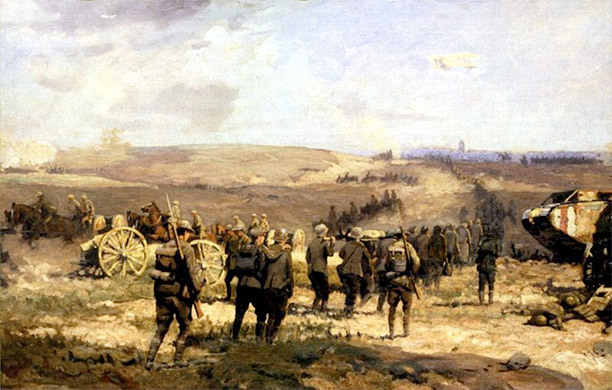 Nick Lloyd revisits John Terraine’s article on the decisive Allied victory at Amiens in 1918 and asks why this remarkable military achievement is not as well known as the first day of the Somme. For the historian John Terraine, who fought a long and lonely battle to rescue the reputation of Field Marshal Sir Douglas Haig – commonly caricatured as a ‘butcher and bungler’ – the Battle of Amiens was his vindication. In his article for History Today, written in 1958, Terraine revisited the scene of the infamous ‘black day’ of the German army on August 8th, 1918. As Terraine reminds us, this battle was a far cry from the barren, bloody results of the first day on the Somme, July 1st, 1916, when the British army suffered its worst day. According to Terraine, Amiens was a triumph of ‘planning and method … of co-ordination and cunning; of the valour and efficiency of the British artillery and tanks; and of the courage, initiative and dash of the infantry’. Much of what Terraine wrote still stands. Amiens was a decisive moment, kicking off Marshal Ferdinand Foch’s ‘series of movements’ that would end with the German government appealing for peace negotiations on October 3rd (an essential prelude to the Armistice on November 11th). Amiens was a perfect demonstration of not only how effective British and Commonwealth forces had become by 1918 – developing an embryonic blitzkrieg – but also how the German army had no answer to this kind of combined, all-arms approach to warfare. Purists will be offended by Terraine’s failure to explain the role of the French army at Amiens (which extended the attack to the south), but more intriguing is the sidelining of Sir Arthur Currie’s Canadian Corps. Indeed, Terraine’s focus on generals Rawlinson and Monash (although not incorrect in itself) seems to miss how important the Canadians were to the battle; it would be true to say that they made the Battle of Amiens. Their four divisions in line, deployed in the centre along the Amiens-Roye Road, formed the spearhead of the assault. At the end of the day they had driven eight miles into the position of the German Second Army. Notwithstanding these quibbles, Terraine’s article, with its focus on training and planning and the coordination of firepower and manoeuvre, prefigures much of the debates that would take place in the 1990s and beyond about the nature of change and development in the British Expeditionary Force (the ‘learning curve’). While the military effort of the ‘white dominions’ – Australia, New Zealand and Canada – has been widely praised (with Canadians being justifiably proud of their tag as the ‘shock army of the British Empire’), the humble British Tommy has often been left behind. Since Terraine wrote his article, however, much work has been done to rectify this imbalance. In contrast to Terraine, who relied mainly on published, secondary sources, a generation of historians have mined the archival record and written detailed studies of many aspects of this story: anything from corps command to individual battles; the development of artillery tactics to logistics, as well as forensic examinations of individual formations, from battalions to divisions. This corpus of knowledge has helped to bring out the complexity of the ‘learning curve’, while helping historians to understand the variety of responses to the Western Front from across the army. It has also helped to move the focus away from Haig (and other senior commanders) onto how the army as a whole adapted to the series of challenges it faced between 1914 and 1918. Nevertheless, Terraine’s mission to move the conventional wisdom of the war on from July 1st, 1916 remains to be fulfilled. The explosion of interest in the centenary in recent months offers an opportunity to revisit this, but there are concerns that the commemoration will still be dominated by ideas of futility and sacrifice, not victory. Indeed, in January 2013 the President of the Western Front Association, Professor Peter Simkins, called upon the government to include Amiens in its commemorations. He argued that ‘to accord Amiens, a victory, the same status as the first day on the Somme, a defeat, would be a significant step in the right direction. The current official programme is as bizarre as marking the centenary of the Second World War by commemorating the Fall of France but not D-Day’. Whether Amiens will ever become as widely recognised as the Somme remains to be seen. Nick Lloyd is author of Hundred Days: The End of the Great War (Viking, 2013).